A trench coat is a key element of the professional woman’s wardrobe. It is the correct outerwear for suits, dresses and other work-wear when the temperature is between 55 and 70 degrees, and it confers elegance upon casual ensembles including jeans and sneakers. While the words “trench coat” probably conjure a general picture in your mind, the actual execution can vary significantly (through cut, material and length) and so, in a perfect world, you might ultimately own more than one to serve in specialized roles. But before we get ahead of ourselves, let’s discuss First Principles. 1. The most versatile length is approximately knee-length (just above, below or directly at the knee). A trench coat that comes to mid-thigh can be very chic, but it doesn’t have gravitas; it’s more a jacket than a coat. 2. Although the classic trench coat is double-breasted, I prefer a single-breasted coat because it may be worn gracefully open or closed. It’s hard to wear a long, double-breasted coat open. Also, double-breasted coats have (or should have) at least two inside, concealed buttons — in addition to a column of exterior buttons — to ensure that the placket of the coat lays flat, and that’s a lot of buttons to deal with several times a day. 3. Your trench coat should be roomy enough to fit snugly over a fitted jacket or thick sweater, but not so big that it looks oversized when you are only wearing one layer (a dress or skirt and blouse) underneath. I am not a fan of the trench coat with a flannel lining that can be removed; it looks bulky when the lining is in and baggy when it is not. 4. I like a belted trench coat, but the belt should be worn knotted (in a jaunty square knot) and not buckled. 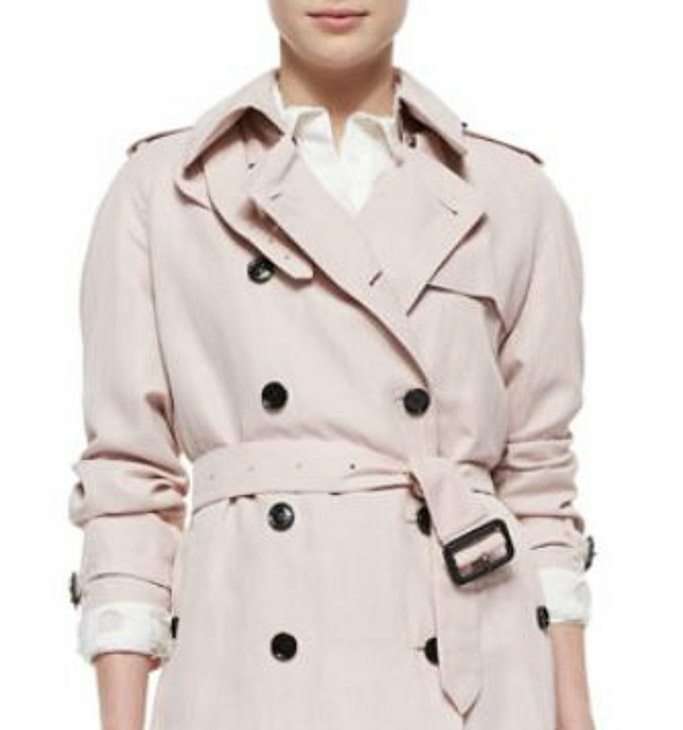 Not quite as jaunty a knot as mine — but this charming Mesmerizing Trench by Nanette Lepore is manufactured in the United States! 5. The classic colors for a trench coat are beige, putty, khaki, and British tan; surely every skin tone will be flattered by at least one of these choices. Keeping in mind that the trench coat should be worn with casual wear, too — you may want to consider dark blue if you frequently wear khakis. A khaki coat with khaki pants is a lot of khaki, where an inky blue coat looks smart with khakis and jeans. If you have more than one trench coat, black or off-black can also be very beautiful. If your wardrobe is almost exclusively neutral colors, you may consider red or scarlet — but only at a shorter length. 6. The material will dictate how dressy the coat is: cotton twill is generally casual, a crisp poplin or cotton blend (cotton with nylon, elastine or other synthetic fiber that creates a slight sheen) is dressier. Wool gabardine is dressy, beautiful, and expensive. 7. If you find a beautiful coat, perfect in all respects except its buttons, you shall find replacement buttons for it and have a tailor sew them on for you. I like horn buttons for a trenchcoat. 9. When you have worn your trench coat for years, you may find the collar is stained or the cuffs are frayed. Your clever tailor can turn the collar for you and fix the cuffs. Trust me; my clever tailor has done both. 10. Ironically a trench coat doesn’t provide much protection against rain. Your buried lede made me laugh! No, they do not. I was confused about this for far longer than I should have been. Robin, I asked The Directrice, “So why are they called trench coats, anyway?” Google reveals all: “The founder of Burberry, Thomas Burberry, created the modern raincoat early in the twentieth century, after he devised a new, breathable water-resistant fabric called gabardine. A trench coat is a type of raincoat that was created by Burberry for officers of the British Royal Army during World War I.” Okay, but if they’re a type of raincoat, why don’t they…? And it’s hard to imagine them doing much for anyone in a trench. Clothes are mystifying.